Welcome to the RemARKably Creative Blog Hop for July 2018. You may be starting the blog tour here at my blog, Annette Sullivan (Lavender Thoughts), or may have come from the person previous to me on the list. If you get off track at any time, the full lineup in the link below will help you move along from blog to blog so you see all the projects. At the moment you are visiting Annette Sullivan (Lavender Thoughts). 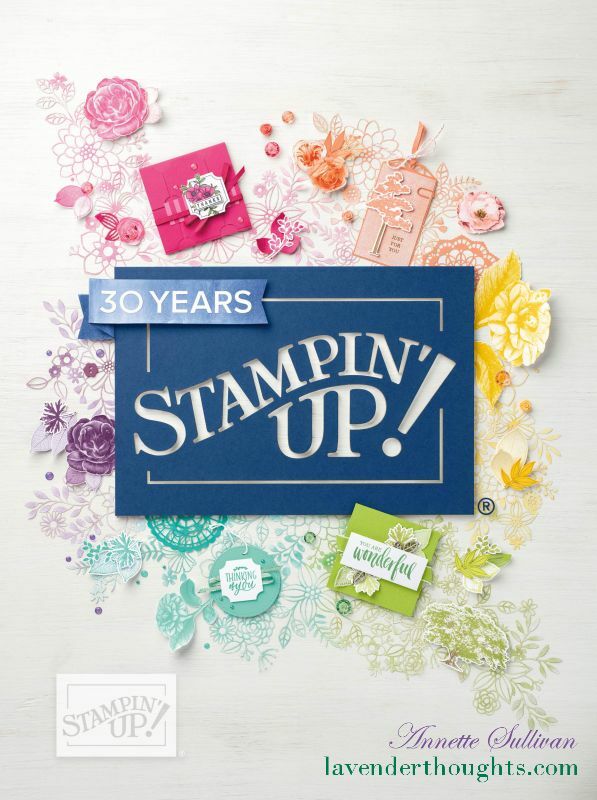 The Theme today is to use new Stampin’ Up! products. I have created a quick and easy background with some masking tape and ink pads using Glossy White cardstock. It gives a very subtle effect. Take a piece of masking tape and swipe it across an ink pad, then swipe it across the Glossy White cardstock. Repeat with all desired colours. Punch a piece of Whisper White using the Decorative Ribbon Border Punch and attach it behind the left hand side of the art panel. Stamp images from Bouquet Blooms and die cut with matching Gatefold Blossoms Framelits and add to the art panel. Stamp a sentiment on Basic Black with Craft Whisper White ink and add to the art panel. Stamp an image with Balmy Blue ink randomly across the Balmy Blue card base. Attach the art panel to the Balmy Blue card base using Dimensionals. The inside of the card has a little decoration. Beautiful card, Annette! Thanks for all of the details, too. Thank you Esther. I hope you enjoy the technique. Great card, I have a fun new technique to try! Thank you Jan. I hope you try it out. Very cute card. Thanks for the technique tip!